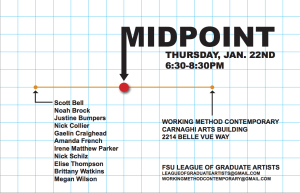 Working Method Contemporary is pleased to announce the opening of Mid-Point, a group exhibition featuring new and old works by FSU Art 2nd year MFA candidates Scott Bell, Noah Brock, Justine Bumpers, Nick Collier, Gaelin Craighead, Amanda French, Irene Matthew Parker, Nick Schilz, Elise Thompson, Brittany Watkins, and Megan Wilson. Mid-Point is an illustration of the transformation of eleven graduate students at the halfway point in their MFA program. The show will display current works as well as works that were part of their application portfolio.